Yesterday Hamdan turned blue. Not just his lips but his entire body. My wife and mother-in-law were terrified. I have come to Kerala for some paperwork before the Liver transplant so I was not there with them. The doctor said Hamdan’s body was not getting enough oxygen. It happens when End Stage Liver Disease gets worse. Although that has been resolved, his bilirubin levels are high, and his brain is getting affected. They are consulting a neurologist tomorrow to know more about his condition, but pushing for a transplant within the next 10 days. I am the donor. I want to get back to Chennai soon, and arrange for the funds in any way possible so I can save my son’s life. My name is Ashraf. My wife, Sumaira and I had our son, Hamdan in October 2016. We live in a small village near Kozhikode. I am pursuing my PhD in Hyderabad. My wife was also pursuing her post graduate degree, but she discontinued her studies when she got pregnant with our son. We run our family on my Fellowship stipend. It has been difficult, and we have a lot of responsibilities repaying past debts, but we hoped things would get better once we graduated. Hamdan had re soon after birth. He got better, but in December, we noticed that his urine turned coffee brown. I rushed him to a local doctor, who was unsure about the course of action and suggested we take him to a bigger hospital in Calicut. Although we admitted him for a while, the doctor was unable to diagnose him. 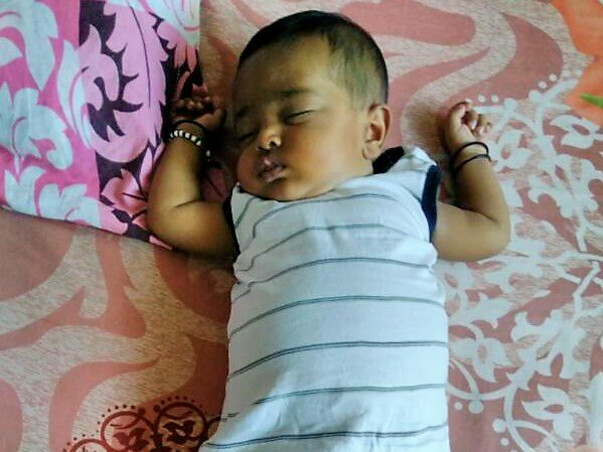 We then moved him to Cochin where he was finally diagnosed with Biliary Atresia with Neonatal Jaundice. Hamdan’s condition became so critical that we had to admit him to the hospital 3 times. The curative treatment? Liver transplant. Unfortunately, they said Hamdan had to gain weight to get the surgery. 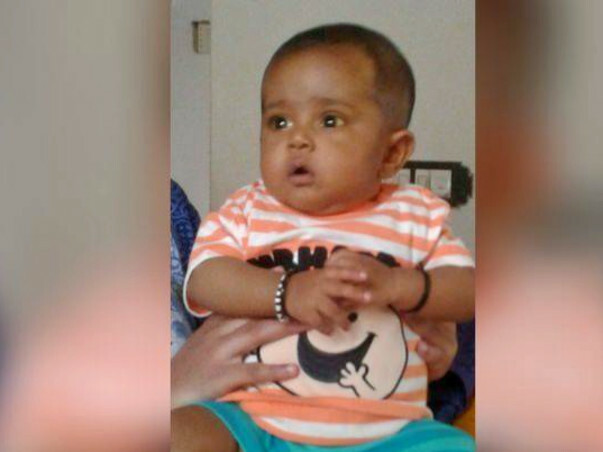 He needed to be 8 kilos, but he was just 6.6 kilos and his disease was getting worse. It did not give us time. I heard about this liver transplant specialist in Global Hospitals, Chennai - Dr. Rela. He was our only chance. We sought another option from him, and he said it is better to go for the transplant now rather than later to avoid complications and higher mortality rate. I volunteered to donate. Our tests are done. Everything is alright. We just must get some paperwork done and get the funds ready for the surgery. The estimated cost for the liver transplant is Rs. 20,00,000. People from our community in Kannur and Kozhikode are crowdfunding to help us, so we are trying to raise half the amount. We need assistance for the other half. So far, we have spent over Rs. 5 Lakhs on Hamdan’s treatment. Whatever I get is hardly enough to run the household. I take help from my father as well who is barely self-sufficient, when I need extra to repay my loans. This is my son’s life. We never expected something like this to happen. We need all the help we can get to save him from this dreaded situation. I can’t even imagine the kind of pain my son is going through. We always express when we are in distress. He cannot even talk. When he completely loses color, looks drained out, inactive, and doesn’t want to wake up, that is when we know that the disease is getting worse. Hamdan is a cheerful baby. 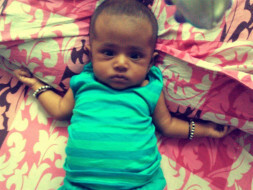 It is extremely depressing for Sumaira and I to see our son like this. We are broken-hearted thinking about what might happen, but right now all the flurry of work around the transplant is keeping us distracting from the terrible thoughts. We are trying to be hopeful. We think this transplant will give him a pain-free, healthy shot at growing up and living a long life. We went back to Calicut in July after Hamdan was completely cured. 10 days back Hamdan started feeling sick. He had severe diarrhea and vomiting. We got him hospitalised in Calicut. 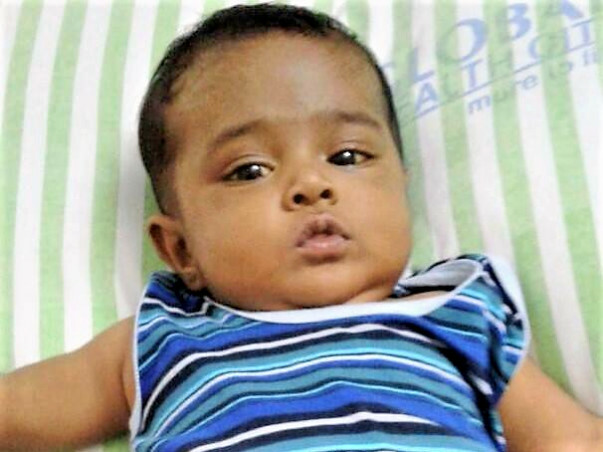 Since the doctor did not recommend us to take Hamdan to Chennai, he was under observation for few days. We are now in Chennai and he has fluid accumulation in his stomach. He is under antibiotics and investigation is being done. We request you all to pray for his speedy recovery. Thanks for being with us and helping our family during tough times. This is regarding Master Hamdan Ashraf (UHID: 1020216525) who is a 7 months old male child who was suffering from persistent jaundice and ascites (decompensated liver disease). He was evaluated and found to have neonatal cholestasis. 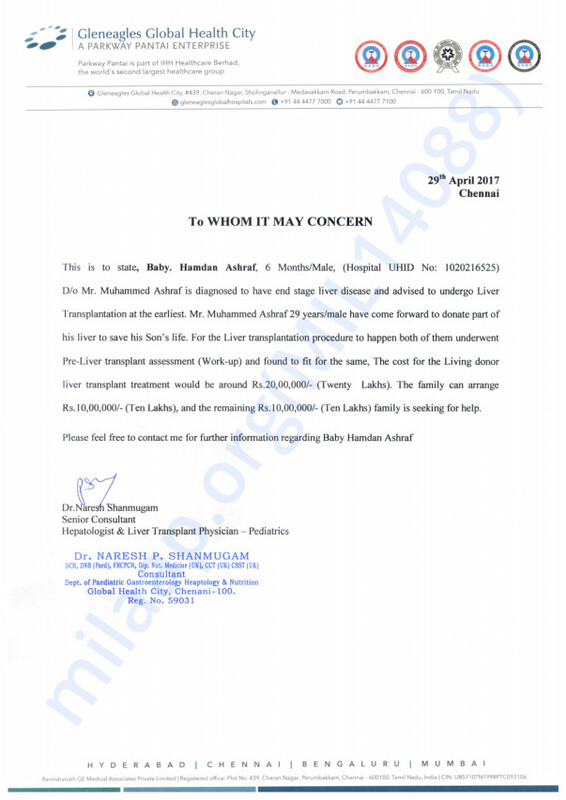 He was advised liver transplantation and his father, Mr. Mohammed Ashraf, came forward to donate part of his liver for the transplantation. After complete work up, living donor liver transplantation was performed on 8th May 2017. Left lateral segment of the father was harvested and then further reduced in size on the back bench and then implanted into the child. The transplantation was uneventful. Master Hamdan is recovering well from the operation. He has been taken off the ventilator and is haemodynamically stable. Liver function is good and his jaundice is steadily decreasing. He is accepting oral feeds and is active. He will require approximately another 2 days of ICU stay and later will be monitored in the ward. Mr. Ashraf (donor) is doing well and is ready for discharge in another 1 day. Here's a quick update from Dr Farouk. "We have got the documents for baby Hamdan. Planning in the surgery on Monday." Get well soon dear Hamdan.